I first met Anjelica Kieltyka by e-mail, on May 4, 2003. Whilst in the midst of the Bailey book controversy, she wrote to me and introduced herself as the woman named "Cher" in Bailey's book. In her remarkable e-mail, she revealed her angst at being used as the "poster-child for autogynephilia" which she insists is an incorrect representation of her own true identity as a lesbian transsexual woman. Anjelica and I began a series of e-mails and then telephone interviews, and she has agreed to help make her story, her views and her writings available openly to the community through this webpage. I will be helping her via interviews, interview reports, her photos and her own writings to present "her side to the story" via this page and my "Bailey Investigation Page". Since then we've followed up by my visiting her in Chicago, and I also met there with several of the other young trans women whom she has been mentoring and whom Bailey used as research subjects. We'll open this page by simply displaying two of Angelica's early e-mails to me, along with some photos of her. (Note that the "...."'s in these e-mails are Anjelica's own style of streaming thoughts together, and do not represent selective quoting). These items in themselves should give the community deep pause for thought about Bailey's theories and about how they were generated. 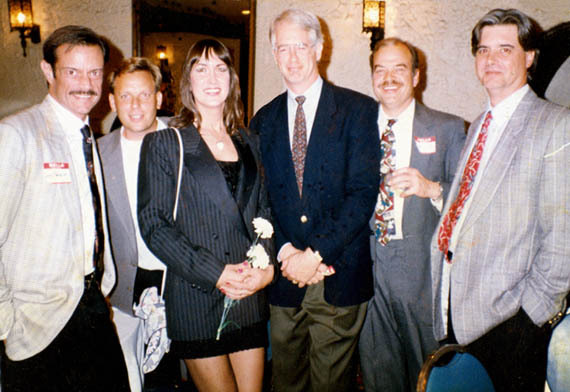 "Anjelica contacted Bailey in the mid-1990s after seeing him on television talking about transsexualism. She hoped to explain how she viewed her own life trajectory and to share her theories about gender variance with someone she saw as a respected authority. This led to a long-standing relationship where Anjelica would get further validation and attention by performing in front of Bailey's classes on sexuality. Anjelica would in turn provide Bailey with access to young transwomen she was mentoring, as well as older transgenderists she knew through a local support group. Bailey would then see these women in a clinical or lab setting, and he would socialize with the young, attractive ones at nightclubs. 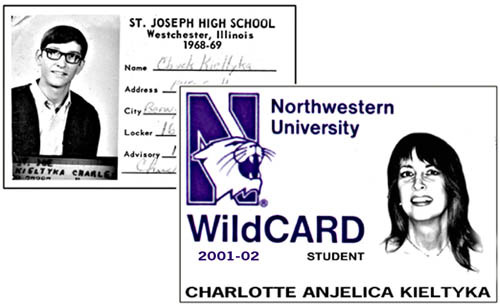 Anjelica has since filed a formal complaint with Northwestern University for the inaccurate and lurid misuse of her biographical information in that book. She has also reported that Bailey admitted to fabricating a key final scene in his book." Dear Lynn, I am the Anjelica Kieltyka that Mike Bailey acknowledges in his book's preface as "[teaching] me a great deal by being honest and open"......I am also "Cher Mondovi" of whom he writes : " Finally, I would never have thought of this book without Leslie Ryan and Cher Mondovi, both courageous women, in their own, different ways." .....It is unfortunate that I could not teach him better or that he failed to see and understand what I showed him. I had introduced myself to him almost 10 years ago and have since then, continued to work with him, argue with him, learn from him, teach him, fail to teach him, respect him (still do-in spite of our disagreements) and lecture in his class room ( often in rebuttal to him, Blanchard and Lawrence and their misinterpretation of fetish behavior that they coined "autogynephilia"). It is most unfortunate that he used me and my case history as the "poster child for autogynephilia"...using all of my case study (under the pseudonym of "Cher") to support his chapters on "autogynephiliacs"... Unfortunate because here was an opportunity to break away from, rather then give further support to a dead "Freudian" mixture of onanism, narcissism and paraphilic transvestite fetishism. I refused to join this bandwagon of Bailey, Blanchard and Lawrence, to which I would also add Zucker and Bradley of the Clarke Institute. Sincerely yours, Charlotte Anjelica Kieltyka, aka. Cher...........P.S. " I'm just a fool whose intentions are good ....O Lord, Please don't let me be misunderstood "......Eric Burden of " The Animals"
interview videotape without authorization; 10-07-03.
expose of Bailey's Queer Science!